Cameron McNeil did a great job bringing this piece into a living room redesign without going over the edge with too much farmhouse modern. I really like this room... seems grown up enough for guests while friendly enough for little ones. Since I'm collecting inspiration for my own living room redesign (wanting it to be shared by adults & kids alike), elements of this room keep popping into my head. 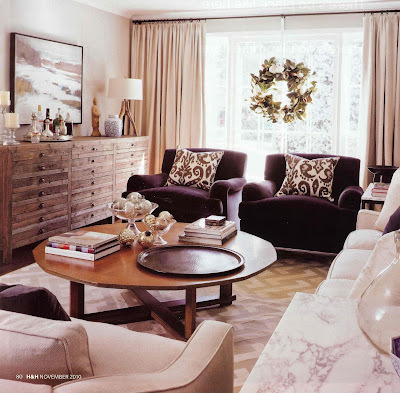 the pair of velvet chairs in front of the window seem like comfy chairs for reading the latest issue of your favorite design magazine, with a cup of cofffe in hand! the clear glass lamps are also a 'fabulous find', check out Walmart instead of Crate & Barrel! I love this room too and you're right - the sideboard works so well here. I have a design crush on Cameron - saw him last week at an event and wanted to hang out with him! I feel like we are on the same wave length Wendy! I loved that room that Cameron did! And I have decided recently that I really want a printmakers sideboard. I did find a couple of unique ones on Craigslist, but they are still pretty pricy! *gasp* I love that printmaker's side board! It brings back really great memories of a print studio class I took in university. I love that this side board is so rustic looking. 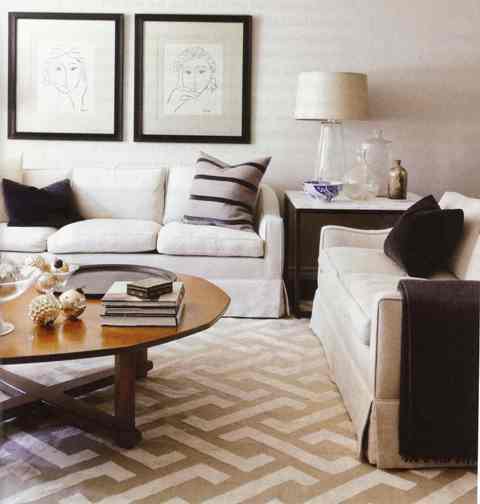 A beautiful addition to the transitional style of the furnishings. 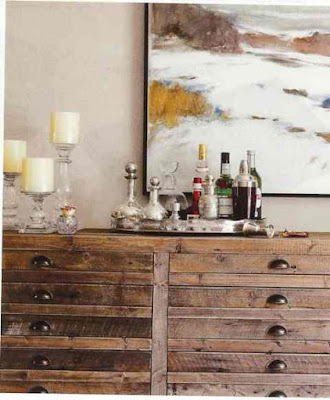 I love love the sideboard- would add so much character to a room. Also loving your idea of velvet chairs..you can't ever go wrong with velvet:) Your inspiration folder is going to make one very pretty room! I love the look, finish, and overall style of the sideboard. Only thing I don't love is what the heck do you store in it besides flat linens? However, it really is pretty! I'm not a huge modern farmhouse fan either, but I like this sideboard. This living room is great - it looks so cozy!! I've never been a big fan of the "modern farmhouse" but I really enjoy the sideboard. Thanks for changing my mind! I love being surprised! that sideboard has a lot of character and not too farmhousey! i really like your blog, thanks for stopping by mine, i'll be back! Love this piece too Wendy, totally with you! The sideboard provides various extra spaces for put on it. It is an item of furniture, which used in the dining room for various things like serving food. A well-designed sideboard definitely can increase the beauty of dining room.